Discover interesting facts and information about the weapons, including the Stone Weapons, used by Native American Indian tribes. Flint and chert were the most effective stone to use when making a Stone Age weapon. The process of making stone weapons from flint was called Flint Knapping and the weapon makers were called Flint knappers. Many Stone Weapons were made from a combination of materials. An arrow or spear had a stone Arrowhead, or point, that was attached to a wooden handle and held together with a cord usually made from animal sinew or with a type of glue. The following chart and list of Stone Weapons provides the names of the different types of stone weapons used by people living in a Stone Age culture, such as the Native Americans, including pictures, images and their descriptions. Projectile Points A projectile point was a stone blade that was hafted to a projectile, such as a spear, dart, arrow, or throwing knife. Tanged points are projectile points that have a tang at one end to facilitate hafting. Projectile points fall into two general types, the large Spears and the smaller arrow points. Clovis points are leaf-shaped and had a wide groove on both sides of the base for fitting into short wooden spear shafts. Arrowheads An arrowhead weapon point or tip made of flintstone usually fixed to an arrow or a spear. Arrowhead points were smaller than spear points and penetrated skin more deeply than when fired by a bow. War Clubs The hitting edge of the war club was rounded and measured between 20 and 30 inches long. 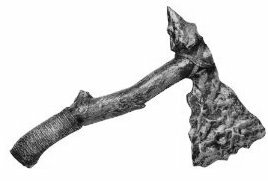 Jawbone Clubs A jawbone club weapon was constructed out of the jawbone of a buffalo or a horse, although not made of stone this was in common use during the Stone Age. The hitting edge of the weapon was sharpened and the teeth were left inside keeping the jaw bone intact. 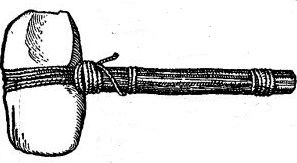 The jawbone club was used as a close combat weapon and had the ability to cut through the chest of an opponent. Hatchets A Hatchet is a small axe with a short handle that was used with one hand. Axe-Like Club The Axe-like club is illustrated in the picture at the top of the page. 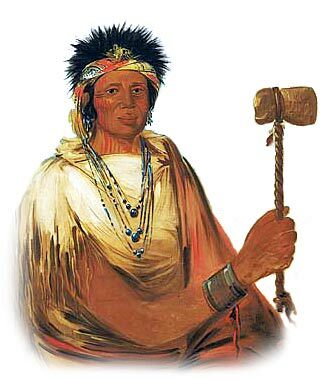 The Tomahawk was a Native American axe-like weapon that had a wooden handle with a head made of stone. The tomahawk could be used for close contact fighting or as a throwing weapon. Slings / Slingshots were one of the oldest and most primitive weapons. 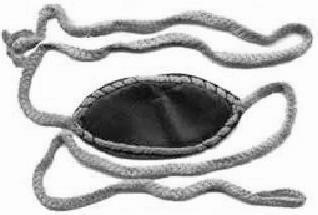 Two pieces of cord made from plant fiber or sinew were tied to a leather pouch to hold the sling stones or pebbles. Stone Weapons. Discover the interesting facts and information which relate to the History of Stone Weapons. The pictures on this site show the weapons and tools that were used by various Native Indian tribes that can be used as a really useful educational history resource for kids and children of all ages. We have included pictures and videos to accompany the main topic of this section - Stone Weapons. The videos enable fast access to the images, paintings and pictures together with information and many historical facts - a great educational resource for kids providing an unusual insight into their culture.